Mother’s Day is Sunday, May 8th, which will be here in no time. As a mom, handmade gifts from my kiddos are my favorite. Give me a macaroni necklace over a store bought necklace any day. =) If you’re looking for a handmade bath and beauty project for Mother’s Day, I’ve rounded up some of my favorites to treat your mom on her special day. The gift of relaxation is the perfect way to pamper mom. 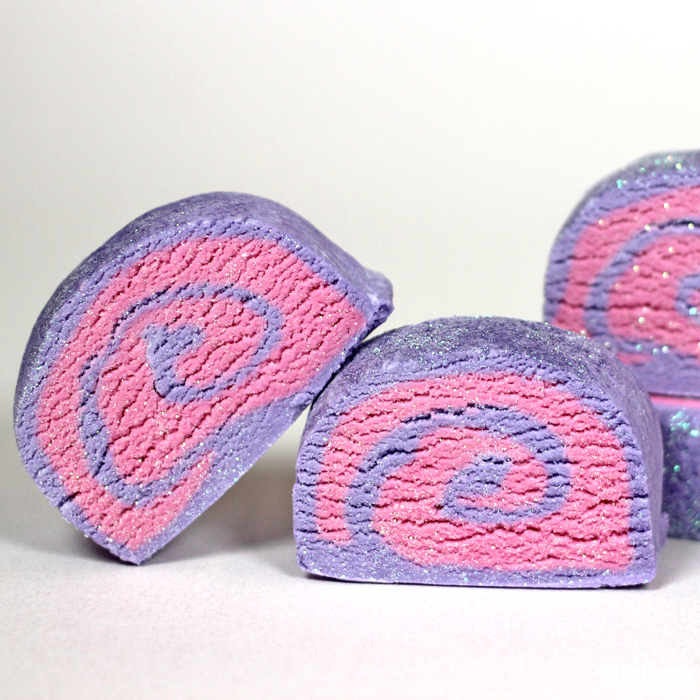 The LoveSpell Solid Bubble Bath DIY creates feminine bubble bars with plenty of sparkle. To use, break up the bar under running water to add big fluffy bubbles to the tub. To see this project in action, check out the How to Make Solid Bubble Bath video on Soap Queen TV. The LoveSpell Solid Bubble Bath DIY creates big fluffy bubbles in the tub. If you’d rather add some fizz to the tub, the Painted Berry Bath Bomb Tutorial uses a mica painting technique for an eye-catching effect. Love gold? 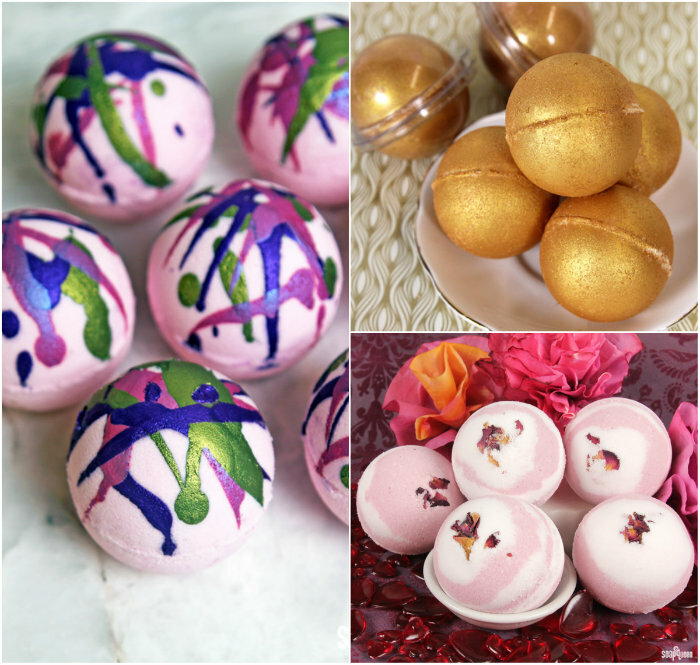 The Midas Touch Bath Bomb is the perfect project for glitter lovers. They are scented with a delicious blend of Champagne and Orange Grove Fragrance Oil – it smells just like a mimosa! The Pikake Flower Bath Bomb Tutorial uses rose petals to add interest and a feminine feel. If you prefer to use natural ingredients, the Lavender & Clay Mondo Bath Fizzy is colored with clay and scented with lavender 40/42 essential oil. Bath teas and salts are another fantastic addition to your bathtub. They are also perfect for beginner crafters because they are easy to make. 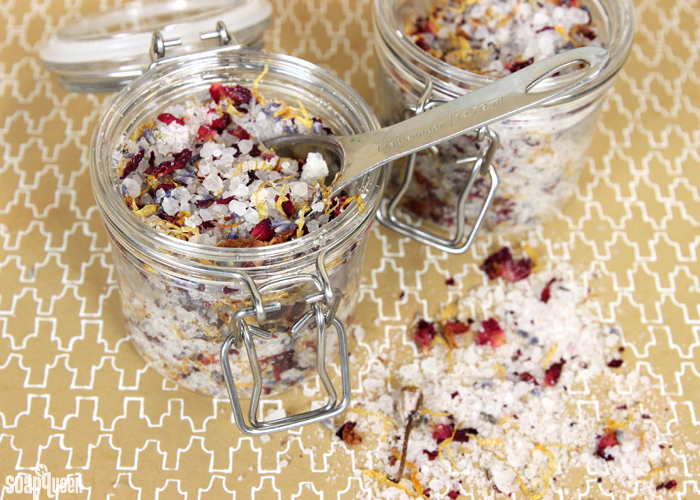 In the Soothing Floral Bath Salt DIY, a blend of dried flower petals are added to salts. The petals give the salts a springy and feminine look. Adding oil to your bath salts gives the water a luxurious feel. In the DIY Soaking Salt & Scrub Wedding Favor Tutorial, a small amount of avocado oil is mixed into the fine grained Dead Sea salt. You can also use powdered goat milk in your bath soaks, as shown in the Lavender & Chamomile Goat Milk Bath Tea. In the Soothing Floral Bath Salt DIY, rose petals, lavender buds and marigold petals are added to a combination of salts. When I first started making cold process soap, my mom was my biggest cheerleader (and most loyal customer). 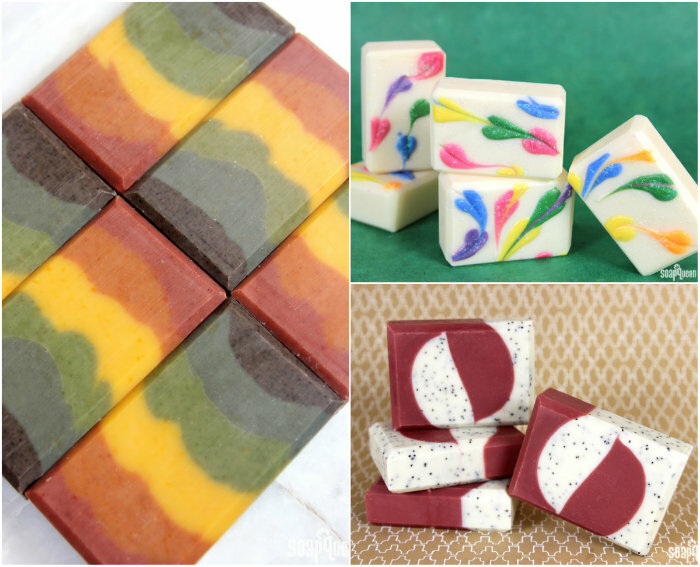 If your mom loves to support your soapmaking addiction as well, she’ll love bars made just for her. 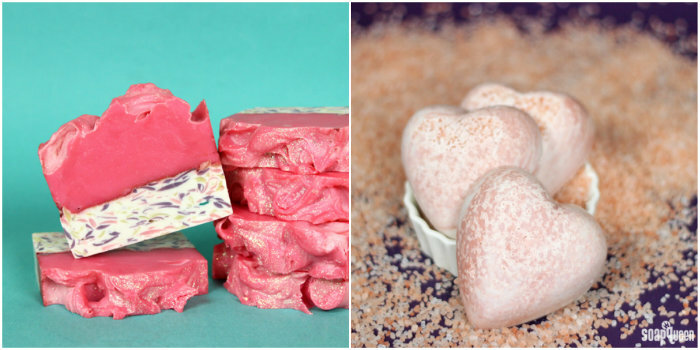 If she is the super girly type, the Couture Confetti Cold Process Soap is right up her alley. The Lavender and Rose Pink Salt Bars are a feminine option that contain natural ingredients like rose clay and Hungarian lavender essential oil. If pink isn’t your mom’s favorite color, the Rainbow Heart Swirl Cold Process Tutorial may include her favorite hue. The Natural Colorant Rainbow Cold Process Soap features layers of vibrant colors made with natural colorants in the Natural Colorants Sampler Pack. The Currant and Cranberry Cold Process is good option if your mom prefers more sophisticated tones. The poppy seeds add a fair amount of scrubbiness that’s perfect for prepping legs for shaving. If you need an easy project this year (after all, Mother’s Day is only a month away!) lip products, nail polish and eye shadows are quick craft that mom will love. The Rose Gold Cosmetic Collection includes everything you need to make nail polish, eye shadow and lip shimmer. Each is made with Rose Gold Mica, which looks flattering on a wide variety of skin tones. Check out the Handmade Cosmetics Roundup for more ideas, recipes and tips. 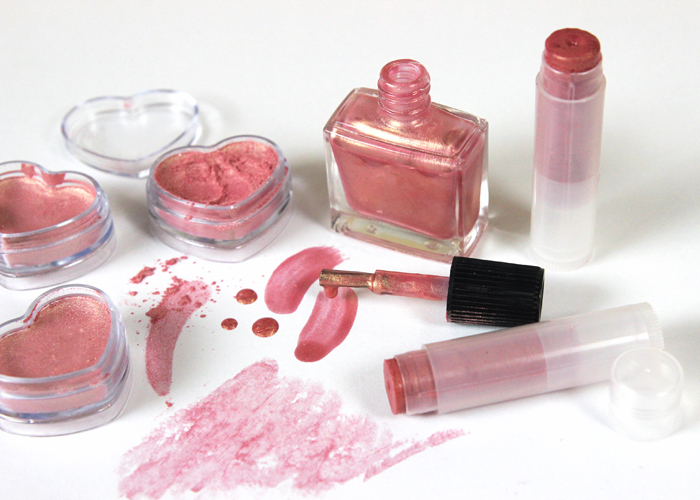 Rose Gold Mica is used to create lip balm, eye shadow and nail polish in this tutorial. Don’t forget about melt and pour soap. 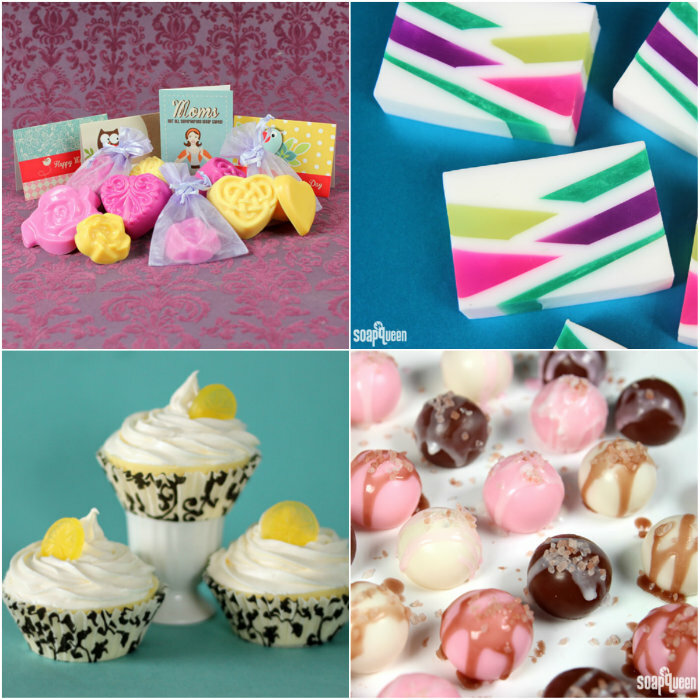 The Mother’s Day Soap Kit includes everything you need to make and package the bars. It also comes with a downloadable PDF to print four different Mother’s Day cards. The cards are also available separately here. If your mom has a sweet tooth, she will love the Melt & Pour Soap Truffles. Just make sure she knows they are for bathing and not eating. =) Speaking of sweet treats, the Luscious Lemon Cupcakes Tutorial always impress. The layers and colors in the Neon Geometric Melt & Pour Soap create an eye-catching design. I am making her some soothing balm. I have been infusing some lavender and Calendula petals scince February and I have that blue chamomile in the tiny bottle I am adding to it. She had some little skin cancer bumps removed from her legs and they need some love. And she will love!! !